The Subaru BRZ is a compact rear-wheel-drive sports car that delivers high-performance thrills and an engaging drive. Tight steering, a well-tuned suspension and a spritely engine all contribute to the dynamic fun that the BRZ provides. 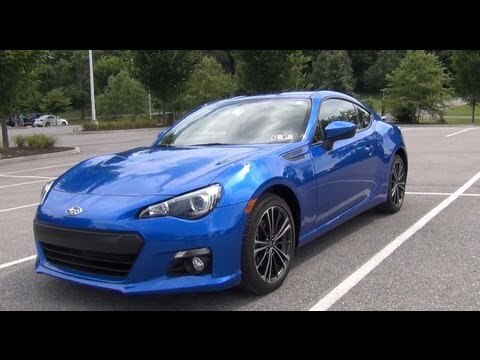 The brz is a great car for the price! My favorite feature of the brz is the handling. It has great pickup and hugs the curves well. Also very comfortable driver’s seat and loads of storage for a sports car! Only drawbacks are the rear seats are ridiculous with absolutely no leg room. Not sure what the point was since it is impossible to fit an adult back there. Also no controls for the stereo on the steering wheel. That should be standard in any car in this day and age. The look of the car does not make it look smaller than it really is. Car is not for families. I love that it is small because I don't have to tote around the kids! Fast, fuel efficient, higher maintenance bills, comfortable seating for 2. It does have a backseat but I do not recommend anyone trying to cram back there. Trunk is rather large for such a small car. Drift missile - peppy, fun car! I love my bra! It is a manual with a boxer motor. As my husband calls it - a drift missile. Smooth drive. Short distance comfortability as the seats can become uncomfortable if long distance trips (2+ hours). Hard to see out that back windshield. Gas efficient. Peppy car. Fun to drive. SUBARU IS RECALLING CERTAIN MODEL YEAR 2013 BRZ VEHICLES MANUFACTURED FROM NOVEMBER 25, 2011, THROUGH MAY 25, 2012. THE OWNER'S MANUAL CONTAINS AN INACCURATE DESCRIPTION OF THE ACTUAL OPERATION OF THE FRONT PASSENGER OCCUPANT CLASSIFICATION SYSTEM. OTHER PORTIONS OF THE OWNER'S MANUAL, DESCRIBING THE AIR BAG SYSTEM, REQUIRE CLARIFICATION. AS SUCH, THESE VEHICLES FAIL TO COMPLY WITH FEDERAL MOTOR VEHICLE SAFETY STANDARD (FMVSS) NO. 208, "OCCUPANT CRASH PROTECTION." SUBARU WILL NOTIFY OWNERS, AND WILL MAIL CORRECTED OWNER'S MANUALS, FREE OF CHARGE. THE SAFETY RECALL IS EXPECTED TO BEGIN DURING JUNE 2012. OWNERS MAY CONTACT SUBARU AT 1-800-782-2783.